The court granted plaintiff's motion for a preliminary injunction prohibiting the sale of two defendants' accused LED fixtures because plaintiff established irreparable harm through price erosion, loss of market share/position, and difficulty in collecting damages from foreign defendants. "After [defendants] entered the market, Home Depot demanded price reductions, which lowered [plaintiff's] wholesale price [by] approximately 22 percent. . . . Home Depot specifically requested that [plaintiff] lower its price so that Home Depot could lower its retail price point in response to the accused products being sold through Lowe’s. . . . [Plaintiff] also explains that it is difficult for manufacturers in the industry to raise prices once customers have received lower prices. . . . [Defendant] is a foreign corporation, presumably with most of its assets located overseas. Therefore, it is likely that [plaintiff] would face significant difficulty in collecting damages even if it prevailed at trial. The potential difficulty inherent in collecting damages from a foreign defendant with limited assets in the United States supports a finding of irreparable harm." The court denied a nonparty's motion to intervene and disqualify one of the law firms representing plaintiff where the nonparty was a current client of that law firm and a defendant in one of eight related lawsuits initiated by plaintiff. "The parties do not dispute that [the nonparty] is a current client of [the law firm]. And, [the nonparty] recognizes that [the law firm] is not representing the plaintiffs in the [case against the nonparty]. . . . Thus, the issue before the Court is whether there exists direct adversity between [the nonparty] and the plaintiffs’ positions in the related cases. . . . [A]lthough this is a close question, the Court finds no direct adversity . . . [T]here is no evidence here that [plaintiffs' counsel] has participated in any motion brought by [plaintiffs] against [the nonparty] or opposed any motion brought by [the nonparty] against [plaintiffs]. . . . [The nonparty] argues that . . . the unique timing in this case — the filing of eight lawsuits, on the same day in the same court, and on the same patents — creates direct adversity. The Court readily recognizes this distinction and agrees that these factors present a much closer call than previous cases. However, the Court declines to find that the coordination of these cases, even on these facts, is dispositive in a finding of direct adversity. . . . [The nonparty's] products are not at issue in the related [cases in which the law firm represents plaintiffs] and the plaintiffs do not allege that the defendants’ products infringe because they comply with a technical industry standard. Moreover, there is no evidence that [counsel] has performed any substantive legal work for [the nonparty] with respect to the patents at issue in this case." Following a jury trial, the court found that plaintiff's medication monitoring patent was not invalid for lack of patentable subject matter. "Because [a prior art article] and at least one other piece of prior art taught away from the claimed combination, the jury likely found the patent was not obvious on that basis. So, too, does this court for patent eligibility purposes. . . . Given the reinvigoration of § 101 by Alice Corporation v. CLS Bank International, 134 S. Ct. 2347, 2354 (2014) . . . and the fact that the medical field is on the cutting edge of what will hopefully be an explosion of new advances in medical treatments based on the effective mining of 'big data' and disciplined use of the scientific method, a real question exists as to the wisdom of continuing to grant patents that last for 20 years on identification of an individual characteristic that may be useful for diagnosis or advances in understanding illnesses. . . . Regardless, there is enough in the combination of the elements in the [patent-in-suit] to get it over the patent eligibility threshold under current law, particularly in light of the jury upholding the patent on § 102 and § 103 grounds. At minimum, [defendant] did not meet its burden of providing clear and convincing evidence to the contrary." The court granted plaintiff's motion for summary judgment that it did not willfully infringe defendant's power converter patent and rejected defendant's argument regarding a finding in a previous action that plaintiff was willful. "[Defendant's] efforts to defeat [plaintiff's] motion are unavailing. They rest principally on purportedly 'striking ... parallels' between the willfulness issue here and that involved in . . . an earlier case in which [plaintiff] was found to be a willful infringer. [Defendant] insists that '[plaintiff] is an adjudged copier as to the [prior] accused products, which remain essentially unchanged.' The Court finds these contentions unconvincing, at least in the context of an objective recklessness analysis for purposes of willfulness. By [defendant's] implicit concession (in describing the new products as only 'essentially,' but not entirely, unchanged), the accused products are changed from what was found to infringe in the earlier case. As [plaintiff] observes, '[the earlier case] involved different products and different litigation positions.' [Plaintiff] reasonably contends that it believes its changes are material and render the now-accused products non-infringing." The court denied defendants' motion for summary judgment that plaintiff's computer virus screening patent was invalid for lack of patentable subject matter because defendants failed to prove the patent was directed to an abstract idea. "[Plaintiff] insists, 'The human mind cannot screen for computer viruses within the telephone network or elsewhere.' The Court agrees with [plaintiff]. The [patent-in-suit] is not directed to screening generic 'data' or 'information.' Instead, the asserted claim specifically recites a computer virus, which has computer-centric implications that cannot be abstracted away so broadly. . . . Claim 7 . . . is 'Internet-centric.' In fact, the key idea of the patent is that virus detection can take place remotely between two entities in a telephone network. This is advantageous because it saves resources on the local caller and calling machines and more efficiently executes virus detection at a centralized location in the telephone network. Claims that 'purport to improve the functioning of the computer itself' or 'effect an improvement in any other technology or technical field' may be patentable under § 101." In the first four months of 2015, U.S. district courts ruled on twenty-four § 101 invalidity challenges at the pleading stage. That is one more ruling of that type than occurred in all twelve months of 2014. Additionally, the grant rate of the motions has increased slightly from 2014 levels. To view a motion success report reflecting the success of these motions since 2008, click here. The court granted defendants' motions to dismiss because plaintiff's shipping container monitoring patents claimed unpatentable subject matter. "[The] Patents are directed to the . . . . abstract idea [of] monitoring locations, movement, and load status of shipping containers within a container-receiving yard, and storing, reporting and communicating this information in various forms through generic computer functions. Plaintiff’s arguments that the patent claims are not abstract because they require physical steps and include the use of tangible components is beside the point; the claims merely recite the abstract idea of monitoring the location and load status of containers in a yard. . . . While Plaintiff argues that the claim is not abstract because it includes the use of tangible components, the Court has already noted that an abstract idea is not rendered patentable just because of connections to the physical world. . . . Adding routine steps of recording, identifying, and communicating the ID code of a particular container, or moving the container from the receiving area to a vehicle does not transform an otherwise abstract idea into patent-eligible subject matter. Instead, the claimed sequence of steps comprises only 'conventional steps, specified at a high level of generality,' which is insufficient to supply an 'inventive concept.'" Following summary judgment of invalidity, the court denied defendants' motion for attorneys' fees under 35 U.S.C. § 285, but sua sponte ordered plaintiff to show cause why sanctions should not be imposed under the court's inherent power. 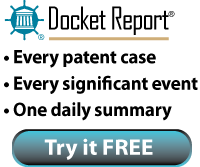 "Notwithstanding the fact the entire case is not exceptional, the Court still finds that attorney fees are warranted for [plaintiff's] behavior under the Court’s inherent sanctioning power. . . . [Plaintiff] had no justification for refusing to stipulate invalidity of the [patent-in-suit] after claim construction. . . . [Plaintiff's] refusal to stipulate or dismiss its claims was in bad faith because it unjustifiably expended the parties’ and Court’s time and resources and delayed judgment. If [plaintiff] wanted to appeal the Court’s claim construction ruling — which is what [it] ultimately did—it could have simply stipulated to invalidity of the [patent]. . . . The Court Orders [plaintiff] to show cause why [it] should not be sanctioned in the form of attorney fees for opposing Defendants' Motion for Summary Judgment." The court denied defendant's motion in limine to preclude evidence of willful infringement even though the court determined that defendant did not willfully infringe. "[T]he court finds that [defendant's] invalidity defense under § 103 is objectively reasonable. In particular . . . while the jury had sufficient evidence to find that the combination of the elements of [certain claims] were not obvious, the court finds this was a 'substantial question' and, therefore, plaintiffs have not met their burden of establishing that [defendant] willfully infringed the patent. . . . Despite this ruling, the court has also decided to permit the jury to resolve the so-called 'subjective' prong of the willfulness standard. This is being done solely to avoid the necessity of an additional trial should the Federal Circuit disagree with this court’s conclusion as to the objective prong, now that the jury has heard substantially, if not all, of the evidence necessary to reach this fact question." The court granted defendants' motion for attorney fees under 35 U.S.C. § 285 including defending against plaintiffs' claim for breach of a license agreement. "[T]he Federal Circuit has recognized that 'in an action having both patent and non-patent claims, recovery may be had under § 285 for the non-patent claims if the issues involved therewith are intertwined with the patent issues.'. . . [R]esolution of all of Plaintiffs’ claims turned on the true coverage of the Method Patent and the implications of that coverage with respect to the [contract]. . . . Because the claims share an underlying factual basis and apportioning fees between the claims would be unfeasible, under both the law of the Federal Circuit and Nevada law, the Court need not segregate the fee award." The court granted plaintiff's motion for judgment on the pleadings that its server communication patent was not invalid for lack of patentable subject matter because it claimed an inventive concept. "Claim 20 is directed to a problem unique to text-message telecommunication between a mobile device and a computer. The solution it provides is tethered to the technology that created the problem. . . . It specifies how an interaction between a mobile phone and a computer is manipulated in order to achieve a desired result which overrides conventional practice. . . . If one looks at almost any patent from far enough away, it could arguably claim an abstract idea. For example, Alexander Graham Bell's patent could be said to claim the abstract idea of oral communication. But his invention was not the concept of oral communication itself; it was a technological innovation that allowed a type of oral communication between people who could otherwise not communicate in that way. The claimed method here does the same: it uses technology that allows communication where it would otherwise be impossible." The court granted defendant's motion for judgment on the pleadings that plaintiff's payroll processing patent was invalid for lack of patentable subject matter and rejected plaintiff's argument that the patent satisfied the standard in Alice Corporation Pty. Ltd. v. CLS Bank International, 134 S. Ct. 2347 (2014) because it covered a 'plurality' of abstract ideas. "[E]ven viewing the claims in the light most favorable to [plaintiff], the [patent-in-suit] is directed to the unitary abstract idea of cataloging labor data. Even if that were not so, however, the Court is aware of no case holding that merely combining two or three abstract ideas brings a patent within the scope of § 101, and the available authority tends to suggest the contrary. . . . There may be some point when a combination of abstract ideas becomes concrete invention; if broken down finely enough, virtually any invention could perhaps be characterized as a combination of abstract concepts, laws of nature, and the like. Merely using routine organization of data to serve a handful of different purposes does not, however, rise to that level." The court denied defendant's motion in limine to exclude the testimony of one of plaintiff's damages experts that the parties would have agreed to a bundled license. "According to [defendant], by assigning to each accused product the same per-unit royalty payment – irrespective of how many of the patents in suit that product is actually accused of infringing – [the expert's] bundled license opinion awards to [plaintiff] a reasonable royalty in excess of that adequate to compensate 'for the use made of the invention.'. . . [Plaintiff's expert] provides substantial evidence in support of his opinion that the parties would have agreed to a bundled license specifying the same per-unit royalty payment for each accused product, including a review of more than twenty-five bundled license agreements previously entered into by either [party]." Following summary judgment of inequitable conduct, the court sanctioned plaintiff's counsel under 28 U.S.C. § 1927 and found him jointly and severally liable for more than $800,000 in defendants' attorneys' fees. "It is now clear that the infringement claims that [counsel] prosecuted on Plaintiff’s behalf were baseless from the start, in that they were premised on alleged violations of rights in a patent that [counsel] had knowingly obtained through intentional inequitable conduct. [Counsel] knew that he had made material misstatements or omissions in procuring the patent before he ever filed the Complaint, and he therefore understood that the infringement claims had no proper foundation. . . . [Counsel] prosecuted this litigation very aggressively and ignored numerous opportunities to withdraw Plaintiff’s claims. . . . [Counsel's] conduct during this litigation was intended solely to maximize the commercial value of a patent that he himself had procured through knowing and deliberate inequitable conduct." In 2013, U.S. district courts ruled on 25 requests for sanctions under 28 U.S.C. § 1927 in patent cases and just 8% were granted or partially granted. In 2014 the number of orders increased to 39 of which 10.2% were granted or partially granted. In the first few months of 2015 district courts have ruled on 10 motions and three were granted or partially granted, for a success rate of 30%. To view a complete history of rulings on 28 U.S.C. § 1927 motions since 2008 with links to the underlying orders, click here. The court granted plaintiff's motion to compel sales information from defendant, including sales information on noninfringing products. "[Defendant's] description of the accused Airplay functionality as only a 'small feature' of certain of its iOS devices does not mean that the information [plaintiff] seeks is not relevant. To the extent that Airplay, no matter how small its role, draws more consumers to purchase video content/video games through the iTunes store so that they can, through their iPod Touch, iPad, or iPhone, direct that content to an accused AppleTV for display on a home television screen, those sales could shape the reasonable royalty analysis. . . . If [defendant] wishes to argue the convoyed sales issue at trial, to either challenge the admissibility of certain evidence or undermine [plaintiff's] theory of damages, it may do so. But the argument is unsuccessful insofar as [defendant] expects to resist discovery of the information [plaintiff] seeks here." The court denied plaintiff's motion to compel the production of financial documents concerning defendant's functionality and services outside the scope of the claimed invention. "[W]hile [plaintiff's] patent claims concern middleware’s ORM process, it has not shown that its patent claims concern the operation of front-end applications that generate object data or the back-end databases that store the relational data. . . . [T]here appears to be no invention in the patents regarding how applications and databases perform their functions. . . . [Plaintiff] argues the requested information is still discoverable because such sales qualify as 'convoyed' or 'bundled' sales. . . . Although [in a different case] the court permitted financial discovery into e-reader content . . . the relevance of the information resulted from the fact that the content sold by Amazon operated only on the Kindle, and the same was true with respect to content sold by Barnes and Noble and the Nook. . . . While the e-reader device and the content displayed on it were coupled, that is not true for [defendant's] middleware; here, all applications and databases work with [defendant's] middleware, whether or not they are manufactured by [defendant]. As [defendant] states, '[t]he very purpose of middleware is to be a neutral bridge that decouples applications and databases, allowing customers to choose each component independently.' Thus, the Court finds that [defendant] has met its burden of showing that the discovery should not be allowed." The court granted defendant's motion to dismiss because the two asserted patents were directed to the abstract ideas of underwriting an insurance policy and determining the insurability of a vehicle and accorded no inventive step that would make the abstract ideas patent eligible. "[The claims] state that the components and apparatus are for calculating insurability. However . . . the claims [do not] explain how the process transforms a particular article into a different state or thing and mere recitation of a generic computer cannot transform a patent-ineligible abstract idea into a patent-eligible invention. The Court finds that [the claims] do not pass the muster of machine-or-transformation test, therefore they do not transform the abstract idea of determining insurability of a vehicle to an inventive computer concept. . . . Because [an exemplary claim] is directed toward a business method of 'organizing human activity' for 'underwriting an insurance policy,' the Court finds that it is directed toward an abstract idea. . . . Even if the Court found that [the claim] was not directed towards an abstract method of organizing human activity, the Court finds that it is directed at a well-established, fundamental practice." The court denied plaintiffs' motion to enjoin ANDA defendants from participating in inter partes review and rejected plaintiffs' argument that defendants were barred from seeking IPR because their Paragraph IV certification was a previously filed civil action challenging plaintiffs' patent. "35 U.S.C. § 315(a) does not bar Defendants from seeking inter partes review before the PTAB because Defendants did not file a 'civil action' by filing a Paragraph IV Certification. . . . A Paragraph IV Certification is merely an administrative application to the FDA certifying that the patent in question is invalid or is not infringed by the generic product; it is not part of any judicial proceeding. . . . Nor is the Court persuaded that the statutory framework of the Hatch-Waxman Act would be undermined if this Court allowed inter partes review before the PTAB to proceed in parallel with this case." The court denied defendants' motion to dismiss plaintiff's induced and willful infringement claims for failure to sufficiently allege knowledge of the patents-in-suit. "From Plaintiff’s allegations involving 3GPP and ETSI, one can infer that the patents-in-suit are implicated in a standard. Although Plaintiff’s factual allegations are not robust, at this stage of the proceedings it plausible that Defendants that (1) associate with a standards-setting organization and that (2) make or sell products that allegedly infringe standard-implicated patents would be motivated to maintain some level of familiarity with patents declared essential to the standard. Furthermore, it follows from Defendants’ alleged knowledge of the patents that Defendants plausibly knew their customers and end users directly infringe the patented claims when they use the accused devices as expected." The court granted defendant's motion for a new trial as to damages only after the court found that certain claims of plaintiff's cochlea stimulation patents were invalid as indefinite. "[T]he jury awarded [plaintiff] damages in the [amount of ] $131,216,325.00 for [defendant's] infringement of [two claims of two patents]. However, the court, based on the testimony and evidence presented during both the jury and bench trial, found [one claim of the first patent] and [both claims of the second patent] to be invalid on indefiniteness grounds. . . . [T]he damages awarded by the jury were not broken down as to each claim or patent. Therefore . . . the court believes that it must grant the motion for new trial so as to allow a damages trial with respect to [the remaining claim]." The Board denied the patent owner's motion to terminate proceedings for failure to name real parties-in-interest because the patent owner's arguments were not timely. "[I]f Patent Owner had challenged the RPI identification in its Preliminary Response, and if we had found the RPI identification to be defective, Petitioner, at a minimum, would have had an opportunity to re-file its Petition correcting any problems therewith. Patent Owner, instead, waited until . . . a mere six weeks before the deadline for the Board to issue its Final Written Decision . . . to bring any issue with the RPI identification to the attention of the Board. We agree with Petitioner that to grant Patent Owner’s Motion under these circumstances would create incentives encouraging Patent Owners to reserve arguments relating to RPIs that could be brought early in the proceeding until after all the merits in the underlying review have been briefed and argued. Our rules, however, should be construed to encourage the opposite. . . . [The] Patent Owner asserts that '[a] challenge to the naming of RPIs is a jurisdictional issue that can be raised at any time.' . . . The portion of the Final Rule upon which Patent Owner appears to rely, states that '[a]fter institution, standing issues may still be raised during the trial.' . . . [T]his statement . . . cannot be seen as 'an open invitation to submit late RPI challenges where a [Patent Owner] could have raised the issue at the outset.'" The court granted defendants' motion in limine to exclude the testimony of plaintiff's damages expert regarding apportionment. "[Plaintiff's expert] determined what hardware components of the accused products were necessary to practice the patent, identifying this as the [smallest salable patent-practicing unit]. Then, he determined the cost of those necessary components as compared to the total cost of the accused product to determine what percentage of the total cost of the accused product was attributable to the SSPPU. [He] applied that percentage to the average sales price of the accused product to create an apportioned royalty base. . . . Although [the expert] did apportion out those hardware components not required to practice the patented feature, he did not properly apportion any value to the necessary hardware components. . . . [Plaintiff] could not plausibly argue that the processor does not have any other function besides practicing the patented feature, but that is exactly what [the expert's] apportionment signifies. His failure to identify the value of those necessary hardware components renders his opinion flawed. . . . Moreover, [the expert's] value determination based on comparing the costs of the necessary hardware components to practice the patented technology and the total cost of the accused product also fails to properly consider the value of the patented feature." The court granted defendant's motion to sanction plaintiff's counsel under 28 U.S.C. § 1927 and the court's inherent authority for pursuing an infringement action after the founder sent counsel an email stating that the actual functionality of his prototype did not match the information in his declarations to the PTO. "[Plaintiff's founder's] admissions, that his device 'did not actually receive caller id automatically from the telephone network,' and that the device 'did not operate,' are in direct conflict with [his] Rule 131 declaration. . . . Filing the complaint in the face of such troubling facts is not a path that a reasonably careful attorney would have followed. . . . [Counsel's] focus on whether [plaintiff's founder] himself believed there was an actual reduction to practice misses the point. The issue in this case is not what level of legal knowledge [plaintiff's founder] possessed about the intricacies of patent law; rather, the issue is whether [plaintiff's] attorneys knew that [his] Rule 131 Declaration contained false statements about having a 'working prototype,' and whether [counsel] filed and continued this case, despite knowing the patent had been procured through fraud on the PTO. . . . [W]hatever [the founder's] confusion was about the legal requirements for actual reduction to practice, it did not absolve [plaintiff's] attorneys, trained in patent law, to see that the Rule 131 Declarations were deceitful and would completely undermine [plaintiff's] ability to litigate patent infringement claims. . . . [Counsel] not only repeatedly misrepresented the functionality of [the founder's] prototypes, but have continued to make misleading statements about what [counsel] actually knew and when they knew it." Following a jury trial, the court granted defendants' motions for attorney fees under 35 U.S.C. § 285 where plaintiff conspired to defraud two entities of ownership of the patents defendants were accused of infringing. "[Plaintiff] contends that this is not an exceptional case because the jury made no findings regarding the existence of a conspiracy or an intent to deceive the [PTO] or [the rightful owner]. . . . [Plaintiff] knew, when it brought this action, that it was not the legal owner of the patent. . . . Despite this knowledge, it asserted that it was the rightful owner of the patent and brought this infringement action. This conduct undoubtedly constitutes bad faith. . . . Bringing this action was nothing more than a perpetuation of the conspiracy. . . . Litigants must be discouraged from bringing an infringement action based upon a patent they know or should have known they do not rightfully own, especially where they defrauded the PTO and the rightful owner of the patent."